By mid-August, the situation on the Eastern Front had changed as the Red Army started a general offensive, beginning with the Belgorod-Kharkov offensive operation (Белгородско-Харьковская наступательная операция)(Operation Polkovodets Rumyantsev) (операция "Румянцев" - 03-23.08) and the Orlov offensive operation (Орловская наступательная операция) (Operation Polkovodets Kutuzov) (операция "Кутузов" - 12.07-18.08) known in German history as the Kursk, and continuing with the Wehrmacht's defensive Battle of the Dnieper line in the North Ukraine. Nevertheless, the Wehrmacht command was still reinforcing its troops around Smolensk and Roslavl, withdrawing several divisions from the Oryol region. As a result, the two Soviet counteroffensives that followed the Kursk defensive operation (Курская оборонительная операция 05-23.07) proceeded relatively easily for the Red Army around Oryol, creating a large salient south of Smolensk and Bryansk. In this situation, the former attack axis, directed southwest towards Roslavl and Bryansk, became useless. The Stavka decided instead to shift the attack axis west to Yelnya and Smolensk. 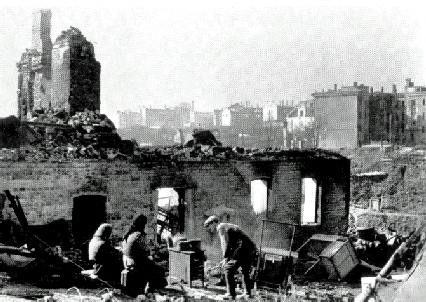 The Yelnya-Dorogobuzh offensive operation (Ельнинско-Дорогобужская наступательная операция) was considered the "key" to Smolensk and Wehrmacht troops created a massive fortified defense position around the city. Swampy areas on the Desna and Ugra rivers were mined and heavy guns set up on hills overlooking the city. The Soviet armies, aware of the Wehrmacht preparations, were reinforced with tanks and artillery during the week from 20 August to 27 August. The offensive finally commenced on 28 August by the 10th Guards Army, 21st Army and the 33rd Army ), supported by 3 Tank, a Mechanized corps and the 1st Air Army. These 4 armies were covering a front of only 36 kilometers (22 mi), creating a very high concentration of troops. The troops, however, had fuel and supplies for 2 weeks at most. Soviet troops moved forward after an intense 90 minute shelling. The artillery bombardment as well as ground attack aircraft significantly damaged the Wehrmacht lines, allowing the Red Army to execute a breakthrough on a 25 kilometer (15 mi) sector front and advance 6 to 8 kilometers (4–5 mi) by the end of the day. The following day, 29 August, Red Army rifle divisions advanced further, creating a salient 30 kilometers (19 mi) wide and 12 to 15 kilometers (7–9 mi) deep. In order to exploit the breakthrough, the 2nd Guards Tank Corps was thrown into the battle. In 1 day its troops advanced 30 kilometers (19 mi) and reached the outskirts of Yelnya. Leaving Wehrmacht troops no time to regroup their forces, Red Army troops attacked the city and started to form an encirclement. On 30 August Wehrmacht forces were forced to abandon Yelnya, sustaining heavy casualties. This commenced a full-scale retreat by Wehrmacht troops from the area. By 3 September Soviet forces reached the eastern shore of the Dniepr. Near Bryansk, things went equally well for the Soviet armies, despite heavy German resistance. However, an identified weakness changed all the previous plans. A surprisingly easy capture of several hills commanding the Dubrovka region north of Bryansk, with numerous German soldiers captured in total absence of battle readiness, came to the attention of General Markian Popov, commander of the Bryansk Front from June to October 1943. This meant that the Soviet offensive was probably not expected along that particular axis. Therefore, the boundary between the First Belorussian Front and the Western Front was shifted south, and two "new" armies executed a single-pincer movement to Dubrovka and around Bryansk, forcing German forces to withdraw. 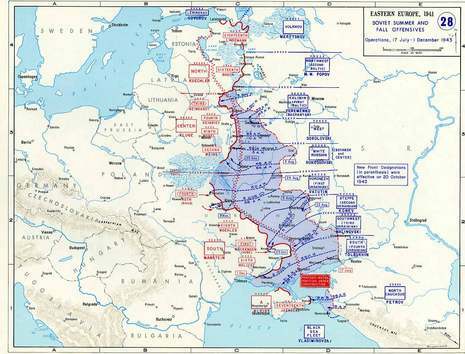 By 6 September, the offensive slowed down almost to a halt on the entire front, with Soviet troops advancing only 2 kilometers (1 mi) each day. On the right flank, heavy fighting broke out in the woods near Yartzevo. On the center, advancing Soviet troops hit the Dnieper defense line. On the left flank, Soviet rifle divisions were slowed as they entered forests southwest of Yelnya. Moreover, Soviet divisions were tired and depleted, at less than 60% nominal strength. On 7 September, the offensive was stopped, and the second stage of the Smolensk operation was over.